Although glaucoma cannot be cured, in most cases it can be successfully controlled. The key to preservation of vision is twofold: early diagnosis and treatment with regular follow-up care. Because glaucoma is a silent disease and usually begins without symptoms, it is necessary to test for it on a regular basis. Annual eye exams help to detect glaucoma in its earliest forms. 1. Eye Pressure is checked frequently. Maintaining pressure at the normal level is a primary goal of treatment. 2. Visual Field Tests are performed once or twice yearly. 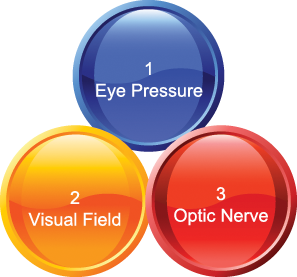 These very important tests evaluate any peripheral visual field loss caused by glaucoma. 3. Optic Nerve – Your doctor will evaluate the health of your optic nerve through annual dilated eye exams, and Optical Coherence Tomography (OCT) testing. Optic Nerve Photos will also help to monitor any optic nerve damage.